Hey! How was your Fourth? Mine? I sewed like a Little Sweat Shop of Skirts. Four Skirts in Four Days my friends. After this made Best Patterns of 2009, I knew I wanted to try this skirt out. I originally wanted to make it up in denim with loads of gold top stitching. But, denim doesn’t really work in my office. So, I decided to eek it out of the last bits of my 4/2008 safari jacket from last year. Together, they make a faux suit. I can’t say that muddy tan from head-to-toe is really my color. I am still wearing the outfit below today. I was likened to a WWII era movie star. I guess it’s the military look? The material is a super tough denim / linen blend. It works great for work because I have nothing in the khaki neutral range. Plus, it goes well with my polka dot blouse from the 1/2008 BWOF. I was freaked out about sizing after my first completed skirt (review to come), so I sewed this one with 1/4 inch seam allowance. Totally not needed. I ended up with almost four extra inches at the side seam! Really. I should have just made a muslin. The skirt is unlined. The seams are all serged and top stitched. Hopefully, enough that they will not unravel. I added a center back seam so I could make my full seat / swayback adjusment (zipper is on the side seam). Umm, I should have straightened my skirt for the photo, eh? Whoops. For me, It’s more important so that my skirt hangs the same length front to back than to not have a center back seam. Despite adding an inch, I could still do a touch more. Here’s the bad thing (and it’s not that my side seam is skewed. I don’t know that I care about that). It’s that I read on PR how the front band directions were confusing. So, I blindly followed someone’s tutorial. Said tutorial was not great. Or, I’m not smart. Either way, I’m too embarassed to show the hot mess that is the inside of this skirt. But, if it lasts more than three washes, I’ve gotten my money’s worth out of it. I love this skirt – you look great! And I also love your shoes. Great looking skirt – it looks like it will be a classic & stylish wardrobe staple. If you’re not feeling the color of the suit, you can always go European-style and add a skintone-flattering little scarf at the neck. Very nice job on this skirt and your alterations. Khaki is so versatile and as you said it looks fantastic with your blouse. I am so glad you made this. It’s one I’d definitely like to make as well. I remember I attempted it when the magazine came out, but I forgot to add seam allowances. I couldn’t believe how small it was, then I realized what I had done wrong, but I wasn’t ready to go back and retrace. You’ve inspired me to get going on this one again. Thanks! Like the detail on the front of the skirt. Looks great on you. Hey, I like this skirt and your suit. It would be a military look in khaki, not tan. You have summer safari look though nailed down! It looks lovely with your blouse. This would be so cute in cornflower blue denim with orange topstitching. Then you could wear it with your tangerine dream shirts that look so pretty on you! But only if you want to undertake the icky front panel again. Great skirt – I should make myself a khaki skirt for work too. Versatile color and this looks great on you. I sympathize with the front and back length issues though. Frustrating. I think the long weekend was everyone’s ‘sweatshop city Arizona’ time – I made my son two sport shirts. LOVE your new skirt. That shape is very flattering on you. You have such a little waist!!! Jealous. I will trade you my waist for your gorgeous head of hair. Interested? That is such a cute skirt. Thanks for reminding me about it. It has been on my todo list for awhile, but keeps getting pushed to the bottom. I now have to move it up. I love this skirt, especially the waistband detail. Love the shoes too. I love this skirt on you, especially with the polka dot blouse. The red shoes are a nice accent. What about a colored belt for the matching top and skirt? Or some bright beads to break up the beige. Love the skirt! I just bought this Burda issue not too long ago and I wanted to make this skirt, but I’m scared now because of your review of the instructions and the tutorial! I hope the skirt lasts you a really long time because the style is timeless! Great skirt! I ended up taking the little pockets off the front of my navy blue one, and I like it so much better. Sorry about the confusing tutorial. Burda’s instructions are hardy ever worth a pile of beans. Keep the skirts coming! You did? I loved your pockets. I actually looked at yours again last night because I was trying to figure out why I didn’t love my pockets. You’re were placed differently than the pattern too I think. Can I also just say you are a topstitching goddess? You’ll note there are no closeups of my topstitching 😀 But, I’ll be copying the white and blue look soon. It looks really nice! I’ve made that skirt twice and feel another coming on – um, in a bit larger size. Dang-it. I ignored all the tutorials and directions and just “did” the front. But mine don’t actually button. I also left off the pockets – I made them once but didn’t like them so didn’t put them on. I like yours with the jacket – you look quite put-together. I love the shoes! Oh, and great skirt, of course! well the skirt looks just great, so call it a win~! “I was likened to a WWII era movie star. I guess it’s the military look?” Plus your beautiful smile. Great skirt! The trench jacket looks great with a matching skirt. I’ve been thinking about doing another of these with long sleeves. Love the skirt, and as others have said, this post has reminded me I always wanted to make that style and never got round to it. 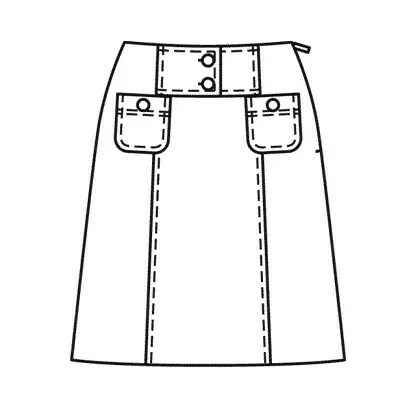 Have you tried the Ginger skirt from Colette patterns yet? It would look superb on you with your fantastically small waist. I love that polka dot blouse. I have a similar fabric. What pattern did you use for that? Looks great, I really like it with the matching safari-esque jacket too. I really like the detailing on this skirt’s front; as for the inside, as long as it holds together, who will know? BTW, your red sandals are wonderful with it and on their own. The skirt is lovely. just my thoughts, but I would alter the pattern to straighten the side seams. This would lead to getting rid of those last wrinkles and make the skirt much more comfortable as well as flattering. Very nice skirt- khaki goes with everything! Love this one! You are making me think an A line might exist that I do not hate. It looks cute on, and I don’t think it’s too short. And you know how I am about short.